Chuggington can be found on Disney Channel. My younger kids and even myself enjoy the show. The idea of Chuggington is cartoon trains which talk and learn lessons about everything. 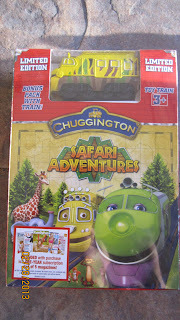 Chuggington has a line of different DVD's with some of your favorite episodes. I was lucky enough to get Safari Adventures which comes with a cute die cast of one of the trains. The Chuggington DVD has 6 episodes and is a grand total of 61mins. Each DVD comes with Bonus features like activity sheets and coloring pages along with games and more. I really love Chuggington it helps relate to my kids as well as teaches them manners and respect for others. 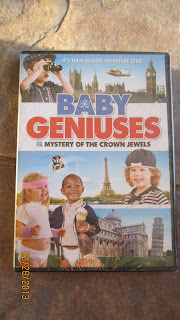 The other DVD I received is Baby Geniuses and the Mystery of the Crown Jewels. This movie is great for the whole family. Kids love seeing others around their age and watching them have fun. As adults we love to watch and laugh with the younger kids as they try to re-enact what they are watching. The movie is about toddlers solving a crime, and who doesn't love watching talking toddlers. Its a very cute movie and is 79 minutes long. This is the 3rd Baby Geniuses film from Anchor Bay. You can purchase both of these new and great DVDs at local retail stores. Baby Geniuses can be found for $19.98 retail and Chuggington can be purchased with the die cast for $16.98 or the DVD only for $14.98. Want to add these great movies to your collection of DVDs? Enter the rafflecopter form below for your chance to win. Contest will end 4/12/13 open to U.S. residents only. Disclosure: I was given both DVDs from Anchor Bay to help with my review. All opinions are 100% mine. I like the Chuggington DVD for my son! Thanks so much for the fantastic giveaway! I think Chuggington but both are great. I really want to own the Baby Geniuses DVD. I'd really like to have the Chuggington. Thanks for the giveaway! Chuggington because my grandson loves it! !